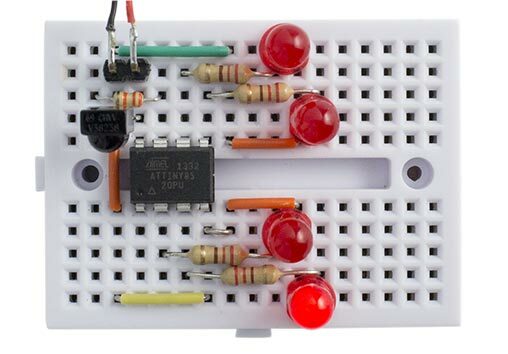 This article describes a simple interrupt-driven routine for the ATtiny85 to decode codes from an infrared remote control. It supports the NEC protocol, used by many remote controls from the Far East, such as the Adafruit remote control  (available from Proto-PIC in the UK ). A selection of suitable NEC-format IR remote controls, from Adafruit, MakerStudio, and eBay (left to right). Test circuit for the interrupt-driven NEC remote control receiver program. I know there are existing IR remote control libraries, but they seem over-complicated, and they rely on polling the remote control input. I decided to try writing a simple IR remote control receiver using interrupts instead. The advantage of using an interrupt routine is that the program can respond to the remote control while carrying out another intensive task, such as navigating a robot or operating a sequence of LEDs. Another advantage is that an IR remote control key can be used to wake the processor from sleep. This routine also handles the repeat code which is transmitted if you keep a key held down on the remote. This is useful if, for example, you want to use the VOL- and VOL+ keys to change the brightness of an LED. The demo program illustrates this application with the test circuit. On this remote control every keypress has the same two-byte address: 0xBF00. The lower byte of the command field identifies the key, and the upper byte of the command field is just the inverse of the lower byte. If a key is kept held down its code is followed by a sequence of AGC pulses 11.25ms long at regular 110ms intervals until the key is released. Note that in the NEC protocol the bits are transmitted in reverse order, LSB first, so the first two bytes transmitted are the address, followed by the command, and finally the command inverted. For full details of the NEC protocol see my earlier article IR Remote Control Tool (NEC). The IR remote control receiver routine uses Timer/Counter0 as a simple counter to measure the intervals between interrupts. The counter uses a prescaler of 64, so with the 1MHz clock each count corresponds to 64µs. If you're using a different clock frequency from 1MHz you'll need to change the program accordingly. The output of the IR detector is normally high, and goes low when it detects a 36kHz carrier pulse. We therefore want to trigger the interrupt service routine on the falling edge of each pulse from the detector. The IR detector is connected to PB2 which allows us to use the flexible interrupt INT0, with the option of triggering on falling edges only. If you want to use a different input pin you'll need to use a pin change interrupt instead, and check for a falling edge in software. The routine leaves Timer/Counter1 free for use by the ATtiny core, for delay(), millis(), micros(), and analogWrite() on PB4. The interrupt service routine is very simple; it starts in a waiting state, checking for the initial AGC pulse and gap. Once this has been found it processes each of the 32 data bits. The variable NextBit is used to keep track of where we are in this sequence. It takes a value of 32 when waiting for the AGC start pulse, and 0 to 31 during each of the data bits. The received code is stored in a 32-bit unsigned long variable RecdData. The routine checks that the length of the AGC pulse and gap is within 10% of the required 13.5ms, corresponding to a count of 211, and if so sets NextBit to 0 to start reading the code. It also checks whether the AGC pulse and gap is within 10% of the 11.25ms width of a repeat code, corresponding to a count of 176, and if so calls ReceivedCode(1). If the length of the AGC pulse and gap lies outside these ranges the routine stays in the waiting state. For each bit the routine checks its length. A 0-bit has a length of 1.125ms corresponding to a count of 18, and a 1-bit has a length of 2.25ms corresponding to a count of 35. If it's a 1-bit the appropriate bit is set in RecdData. If a bit is too long, or the overflow flag is set indicating that the counter has wrapped around, the processing of the code is abandoned and the routine returns to the waiting state. When the interrupt routine has received the last bit it calls ReceivedCode(0) to act on the code. If necessary, this could put the code into a buffer and set a flag to indicate that a code is available. In this sample application ReceivedCode() simply changes one of the ATtiny85 outputs, PB0, PB1, PB3, or PB4 depending on which key was pressed on the remote. This slowly beeps out the 32-bit code as a series of audible high and low beeps, MSB first, with a high beep representing a '1' and a low beep representing a '0'. It therefore provides a rough and ready way of revealing the code produced by each key. The 33kΩ resistor isn't strictly necessary, but it avoids errors when uploading programs to the ATtiny85 by isolating the output from the IR receiver from PB2 on the ATtiny85. Alternatively, remove the IR receiver from the breadboard while uploading. I compiled the program using the ATtiny core extension to the Arduino IDE . Select the ATtiny85 @ 1 MHz (internal oscillator; BOD disabled) option on the Boards menu and choose Burn Bootloader to set the fuses appropriately using the Tiny AVR Programmer Board; see ATtiny-Based Beginner's Kit. Then upload the program to the ATtiny85. 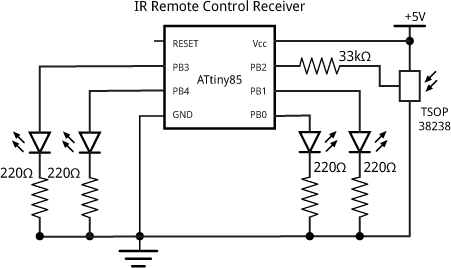 Here's the whole ATtiny85 IR Remote Control Receiver program: IR Remote Control Receiver Program.